Toss out your takeout menus! 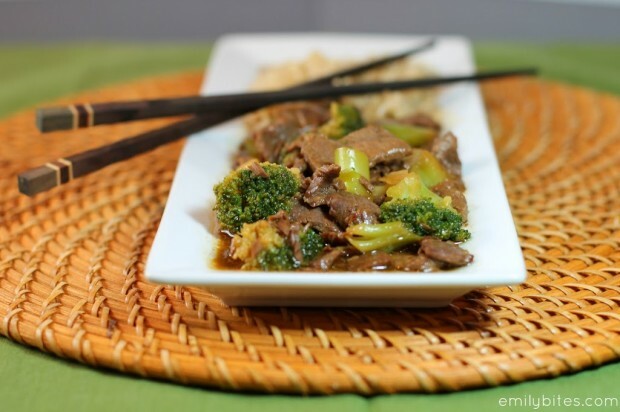 This Slow Cooker Beef & Broccoli is the best tasting Chinese food I have ever made at home, not to mention the easiest. It even tastes better than any beef & broccoli I’ve ever eaten out of a white paperboard pail. 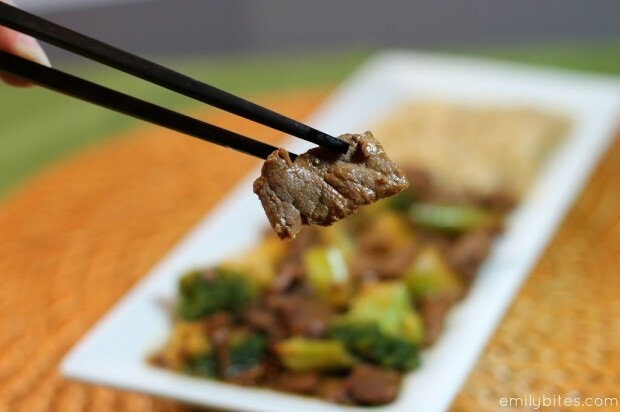 The brown sugar and the garlic and the sesame oil and the soy sauce all mix together to make the most delectable sauce, and the beef and broccoli cooked to perfection in the slow cooker. This recipe only takes 4 ½ hours total to cook, so it makes a great weekend recipe. If you work an 8+ hour day during the week like I do and can’t let this cook while you’re gone, you can also always cook it in the evening and refrigerate to serve the next day. My favorite part about using a slow cooker is just being able to toss the ingredients in and walk away, and this worked perfectly. I let the recipe start cooking a little after lunch time today, went to the gym, did some cleaning and errands, read for a while, got some other things done, and when it was dinner time, voila! It was already waiting. 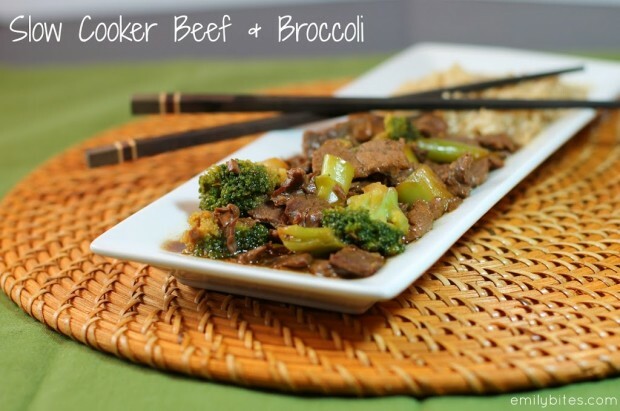 I found this Slow Cooker Beef & Broccoli recipe on one of my absolute favorite blogs, Table for Two. Every dish she posts is absolutely drool-worthy. If you’ve never been to her blog, check it out for more delicious recipes! Combine the broth, soy sauce, brown sugar, sesame oil and garlic in your slow cooker and stir together to combine. Add the uncooked beef pieces and mix until the beef is covered by the liquid. Turn crock pot temperature to low and cover. Cook for 4 hours (the original recipe says 6 but my beef was perfect after 4 hours, so check to see if yours is done at 4 and if not you can add more time) until the beef is cooked through. Remove 4 tablespoons of the liquid from your slow cooker to a bowl and stir in 2 tablespoons of cornstarch. Once combined, add the cornstarch mixture back into the slow cooker and mix in thoroughly. Add the frozen broccoli and stir in. Re-cover the slow cooker and cook on low for another half hour. This looks so good! I can’t wait to try it! Thank you for posting it. Made this for dinner tonight using venison back straps which are super lean & tender. Thumbs up! Looks amazing, can’t find Ziplist on your page anymore or the ability to save the recipe, is that changed now? It’s still at the end of each post! Could you use fresh broccoli? fresh is not always better, unless you are buying local. frozen actually holds the nutrients better because they are frozen right after they are picked where as fresh are sprayed and on a truck for a few days! YUM! This looks seriously amazing. I wonder how a little fresh ginger would work in it.. I bet a little ginger would be delicious! What would you serve this with? I know traditionally it yould go well with rice, but white rice would be wayyyy to many extra points and I don’t like brown rice. Maybe just over more steamed broccoli? I ate mine with brown rice but hou could certainly toss more vegetables in there or maybe serve it over noodles. I don’t like brown rice either, but it was so good with it! The sauce definitely makes it good! White rice and brown rice are the exact same number of point – so you can totally use white. quinoa would be great too! I’ve seen cauliflower rice, but I’ve never made it. That would be a good exchange. Cauliflower rice is soo good and really easy to make! You could certainly try it! Looks so great-???? my husband doesn’t like soy sauce or teriyake–? any suggestion for a substitute?? Would be so appreciated!! LOUV YOUR SITE!!! Hm, I’m not really sure what to suggest – it sounds like your husband just doesn’t like Chinese food! Haha. The soy sauce in this is one of the major flavors, so I wouldn’t recommend replacing it. Wow, that’s pricey! I think the sesame oil adds a ton of flavor. It’s a lot cheaper than that at my grocery store…do you have any others you can check? do you have a Bottom Dollar foods near you? you can get a small bottle for less that $4 there. This was very good! I cooked it for dinner and even with my nostrils clogged with the remnants of the flu I can smell it and I took a small bite… best at home chinese food I’ve ever made. This was the first recipe I’d tried off your site, I’ll definitely be making it again! I think next time I might add a little fresh ginger as someone else suggested, and a little red pepper flake to give it a little kick. Those sound like yummy additions! I made this exactly as the receipe called for and it was WONDERFUL! I have always wanted to cook my own Chinese food dishes but never could get the taste right. This was so easy. I love your site. Thanks for doing all the work for us. Aw, thanks so much! I’m really glad you loved it. I just made this for dinner tonight, and it was a huge hit. Served it w brown rice, and can’t wait to have the leftovers for lunch tomorrow! I made this last night and it is absolutely delicious! I used peanut oil instead of sesame oil since that’s what I had on hand, but that didn’t seem to make a huge difference. My coworkers were VERY jealous today when they smelled my amazing food. It was fantastic reheated. Next time I might add more broccoli, but I wouldn’t change a thing about this recipe. Thanks Emily! So happy it was a hit! Would it be possible to make this not in a slow cooker but just on the stove? I sadly do not own a slow cooker. Do you know what the adjusted cooking time would be? Hi There! I made this on the stove top last night as I forgot to prep the crock pot… Here’s what I did. Cooked the meat in a non stick pan. Afterward, combined the broth, soy sauce, sugar, sesame oil and garlic. Cooked at med heat for about 10 min. Mixed the corn starch and broth and cooked for another 5 min. Added *cooked* broccoli and mixed. It turned out AMAZING and didn’t take long at all. Thanks emilybites for the awesome recipe! On our “to keep” list. I think I bought the wrong meat! Mine is top round steak cut thin, not roast. Do you think this will still work the same way?? I bought top round cut about 1/4 inch thick and then about 1 inch by 1 inch cuts I am tripling the recipe as I have 7 people to feed but any good piece of beef would work with this, slow cooking meat in a crock pot makes most meats tender. Just made this tonight – Oh. My. it is sooooo good!!! Even my KIDS ate it! Definitely a new regular menu item in my house! Any advice for making this in a pressure cooker? I’ve never used a pressure cooker before – I don’t own one! Sorry, I can’t help there. This was delicious. I’ll put it this way – I had one serving, and my boyfriend had three! I was hoping for leftovers, but it’s all gone! One thing – My beef was actually a little overdone at 4 hours. I’ll probably check it at 3 hours next time. It probably depends on how big your pieces are. THIS.WAS.DELISH!!! Thank you so much for the yummy recipe!! Made this last week and stopped at Wegmans this morning to pick up some more of the beef cutlets to make it again soon. It was delicious! Thanks!! If I use fresh broccoli, do I need to cook it first before adding it to the crockpot? Emily – this was SO good. Thanks for another great recipe!!!! This is excellent! I’m 2/2 on your website now! This is an amazing recipe and so easy to make. My family loves it. I doubled the recipe so I could have left-overs. I’ve made this twice now–the entire family loves it!! I tried this tonight and it was delicious. I love orange flavor, so I sliced up an orange and added to crock pot, then also added a little bit of ginger and some red pepper flakes for a little kick. I fished out all the oranges before eating. It was so good! Yum, I love oranges too! How long does it need to cook on high? This looks amazing but between the broth and the soy sauce I can’t even image what the sodium count is on this. any idea??? Nope, I’ve never tracked sodium before. I used low sodium soy sauce and I’m sure you can do reduced sodium beef broth. Hope that helps! This was delicious and easy to prepare. Leftovers were fantastic. Made the recipe as written, but for next time I think I will add more broccoli and possibly water chestnuts as well, because I love them! This recipe is a major win, thanks! I am making this tonight, I am tripling the recipe cause there are 7 people to feed, and I omitted the sesame oil thinking it wouldn’t make a difference, I hope I am not wrong. When I smelled the liquid mixture it reminded me of beef jerky, so I think it will come out pretty tasty without it. I also used garlic powder and not fresh garlic since I forgot to get some when I got the other ingredients last night. I am thinking of going to buy chow mien from the place down the street to go with it but think the Jasmine Rice I am making will be just fine…maybe I will buy some egg rolls who knows lol…I expect my kids will LOVE this and my son has been trying to get me to buy the packaged mix from the store to make this and I have hesitated so I am glad I came across this recipe. Also, in tripling the recipe would I also triple the cornstarch mix? I would think so but just want to be sure. sounds great! Except the frozen broccoli part. Why not use fresh? Unthawed broccoli??? Maybe you mean unfrozen or thawed broccoli. Made this tonight and it was deeeelicious!!! Will definitely be on the regular rotation. I made this yesterday and it’s super delicious! My wife and kids really liked it and they eat a lot! I will definitely cook this again. Thanks for sharing! Making now. Just sampled and OH MY!! Thank you! Terrific recipe! This was great and easy! I used lean stew beef and it completely fell apart, but it was still delicious! Served over brown rice. This is my second time making this.. it is absolutely delicious. The sauce smells incredible while it’s cooking and the meat came out so tender. Even though this recipe is coming up on its birthday, I am finally making it!! Looking forward to seeing and tasting the results! Making this tomorrow but with boneless chicken breast instead of beef — will add water chestnuts scallions and more fresh broccoli — so glad i have the sesame oil. Making home made fried rice to go with it yummm. I just made this in my crockpot with (raw, sliced in strips) chicken breasts and fresh (cut into little florets) broccoli and it tastes DELICIOUS! I only needed to cook it on high for about 45 minutes, then added the cornstarch and cooked for an additional 15 minutes. Thanks for this AMAZING recipe- it will definitely go into my rotation! Emily – have you ever tried to freeze the beef/broccoli leftovers? Thanks! I haven’t, sorry. If you try it report back! This dish was so delicious!! I added mushrooms and onion. I will definitely make this again. Emily – first let me say that I am a devoted follower of your recipes and use them all the time. Thank you so much. I have made this dish a couple of times now and have a couple of comments. First, I agree with one of the commenters above that my meat was done well before four hours so next time I will decrease the time a bit. Second, I have consistently found that the frozen broccoli cooled the mixture down so much that the pot was lukewarm after the final 30 minutes, so I’m going to up the time after adding the broccoli to an hour. Hopefully, that will not make the broccoli soggy! Finally, I haven’t had much luck getting the sauce to thicken up with the cornstarch so next time I’m going to try removing some liquid right at the end and doing that part on the stove to see if I have better results. This is a great dish with brown rice, or I have served it with cauliflower rice also! Thanks again for the great recipes.